No matter the type or age of building you’re renovating, spray foam insulation delivers ongoing energy savings while strengthening the building structure. Look to DFW Urethane for the highest standards of performance for spray foam insulation in Dallas, Fort Worth, Austin, San Antonio, Texas and Oklahoma. SPF insulation dramatically reduces energy usage by creating a seamless air seal. It magnifies the value of installing energy-efficient windows and other upgrades. 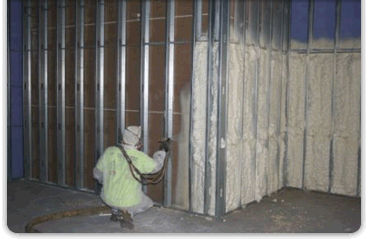 Spray foam insulation enables HVAC systems to operate more efficiently. So, rather than compensating for energy loss, you can reduce upfront expenses for excess HVAC tonnage or equipment. Unlike other types of insulation, sprayed foam seals the holes and gaps created during original construction, and through settling or building wear. It also addresses other sources of costly air leaks: wall cavities, laps in sheet metal, fine cracks in bricks, spaces under doors, and gaps around electrical boxes, water and gas lines. SPF’s speed of application and minimal drying time means sheetrock can be installed within minutes of spraying. What’s more, spray foam insulation is safe, environmentally friendly, versatile and effective at low and high temperatures. It is also used in remediation of health hazards by effectively encapsulating mold and asbestos within building walls and roofs. After a specialized abatement contractor remediates the asbestos or mold, DFW Urethane sprays polyurethane foam to seal it in before sheetrocking. The hardened foam provides an inert barrier to moisture condensation, inhibiting bacterial mold and fungal growth. DFW Urethane is your single-best source for commercial spray foam insulation in Dallas, Fort Worth, Austin, San Antonio, Texas and Oklahoma. Call us today!